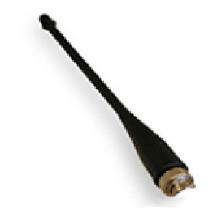 The L-AN100 433 MHz Wavetrend whip antenna has been designed for optimal RF receiving performance with the Wavetrend reader range. This antenna attaches to the reader via a BNC(M) connector. This antenna has an omni-directional reception pattern around the vertical axis with null points being at the extreme ends of the stub. The antenna is housed in a rugged waterproof rubber mould that is UV resistant and can be used outdoors.